Those of you who know me, know that I absolutely love water sports. I’m a keen scuba diver, go swimming once a week, and try to compete in water related events whenever I can. I also love my gadgets! So, when I was emailed by Underwater Audio, the creators of an underwater iPod Shuffle, to review their product, I jumped at the chance. The iPod Shuffle and its accessories arrived last week and yesterday I had the chance to try them out at my local pool. 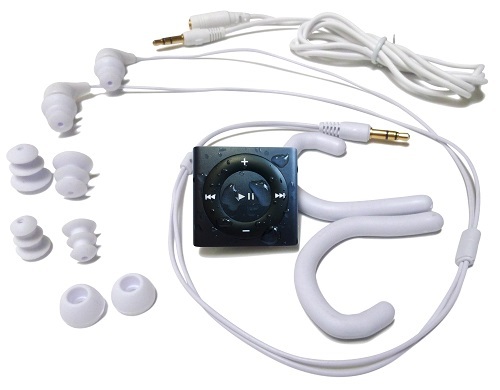 A genuine iPod Shuffle which they have personally waterproofed – you can choose the colour. You can also buy the iPod Shuffle on its own if you already have the accessories. Underwater Audio waterproof each of their iPod Shuffle’s individually. Each iPod can be used in the exact same way as a non-waterproofed iPod. You can easily link it up with your iTunes account and download all of your favourite songs onto your device. The product I tried held up to 2GB, which is more than enough for a month’s worth of swim sessions. The iPod Shuffle can run for 16 hours on one charge, and it is fully waterproofed, so you can use it whilst swimming, or whilst running in the rain for example. I tested the Underwater iPod Shuffle at my local pool. Unfortunately, I wasn’t able to take any photos of the device in action, but I can wholeheartedly say that I love it! It easily fastened to my swimming costume, and the Swimbuds headphones fit easily into my ears, and didn’t fall out once. The sound quality of the device was exceptional, and I actually found that it even improved underwater! I completed my usual workout, and it was absolutely awesome to be able to listen to music whilst swimming lengths of the pool. Usually, I can get a little bit bored, but being able to rock out with some Guns n Roses whilst swimming really transformed my swim session! I even plan on downloading some audio books for future sessions. I have tried waterproofed audio systems before, but I have to say that Apple do provide a superior product to most. And, as Underwater Audio’s products come with a 2 year warranty, you can rest assured that your product has been waterproofed correctly and will actually do what it says on the tin. 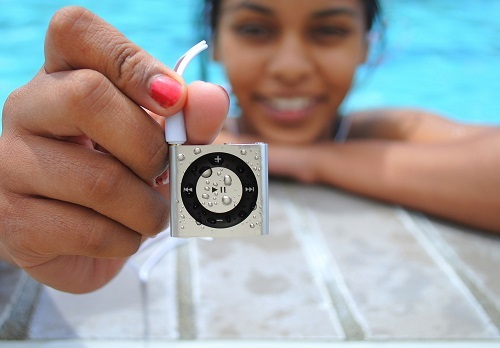 With a RRP of $180, the Underwater Audio iPod Shuffle isn’t the cheapest device out there. But I can wholeheartedly recommend it. It is currently available on Amazon for $125, and on the company’s website as part of a bundle package for $139.99. Go try one out, they will revolutionise your swim workouts, and you’ll never look back! This entry was posted in Reviews, Scuba Diving, Surfing, Wakeboarding and tagged iPod Shuffle, Review, Underwater Audio. Bookmark the permalink.